There may be just 8 games on the National Hockey League schedule today, but at least we get a full day of action! Philly and Tampa will get things started at 1 p.m. eastern, the first of 5 afternoon games before the evening slate is highlighted by an outdoor game between the Leafs and Capitals at the U.S. Service Academy in Maryland. We’re coming off a 1-1 day yesterday (if only the Rangers could have held onto their first period lead for 2 more minutes to cash the +152 first period moneyline) after getting March off to a great start with a 3-0 Thursday. Today, we’ve got bets on 3 of the 8 games, including a pair of late afternoon plays, and may decide to add more later (if we do, we’ll post it on Twitter and Facebook). Note: We’re posting earlier than usual today because we’ve both got busy Saturday plans with the kids, so the goalie information won’t be as reliable as usual. Good luck if you’re tailing along or whatever else you’re on today. Reasons to bet New York: The Islanders are 2-1-1 in their last 4 visits to Pittsburgh. The Penguins have lost 3 straight, allowing 17 goals during the skid. Reasons to bet Pittsburgh: The Penguins are 23-8-1 at home and in a prime focus spot after allowing 8 goals in a loss to the Bruins on Thursday. New York lost last night at home to Montreal, the Islanders’ fifth straight loss, and is giving goaltender Chris Gibson just his third NHL start. Reasons to bet Montreal: The Canadiens are 3-0-3 in their last 6 games, allowing just 10 regulation time goals during that span. Boston has given up 3+ goals in 8 of its last 11 outings. Reasons to bet Boston: The Bruins are 21-7-4 at home and have beaten Montreal 3 times already this season. The Canadiens are 9-19-2 on the road and playing for the second straight night. Reasons to bet Ottawa: The Senators won 5-4 last night in Vegas, the 7th time in 10 games that Ottawa has scored 3 goals or more. Arizona is just 11-18-4 at home this year. Reasons to bet Arizona: The Coyotes are 7-2-1 in their last 10 games. Ottawa is 8-18-5 on the road and has allowed 4+ goals in 6 of its last 10 overall. Reasons to bet Philadelphia: The Flyers have won 7 straight on the road. Tampa has allowed 3+ goals in 7 of its last 10 games. Reasons to bet Tampa: The Lightning is 21-6-2 at home, where it has won 9 of its last 11 against the Flyers. Philadelphia has scored 2 regulation time goals or less in 5 of its last 7 games. Reasons to bet St. Louis: The Blues may have some confidence back after snapping a 7-game losing streak Wednesday with a 2-1 win over Detroit. Dallas has allowed 5+ goals in 4 of its last 8 games. Reasons to bet Dallas: The Stars are 22-10-2 at home. St. Louis has scored 2 goals or less in 6 of its last 8 games. Reasons to bet Chicago: The Blackhawks should be motivated to play for respect after getting whipped 7-2 Thursday in San Jose. LA may look past the Hawks with 4 days off on deck. Reasons to bet Los Angeles: The Kings have won 6 of the last 7 meetings, including a pair of 3-1 wins earlier this season in Chicago. The Blackhawks have lost 11 of their last 14 games. 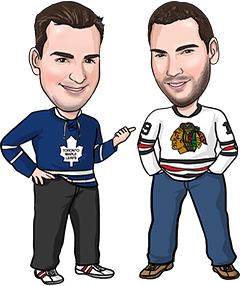 Reasons to bet Toronto: The Leafs are 13-2-2 in their last 17 games. Washington has scored 2 goals or less in 5 of its last 7 games, excluding empty netters. Reasons to bet Washington: The Capitals are 22-9-2 at home this year. Toronto has given up 3+ goals in 8 of its last 10 games. Reasons to bet New York: The Rangers should bring lots of energy following back-to-back victories in Vancouver and Calgary. Edmonton is just 13-16-2 at home. Reasons to bet Edmonton: New York has allowed 106 shots in its last 2 games.